Bread-making used to be an intimidating idea for me. But over the years I have learned that it is fun and very rewarding. I have made many terrible and inedible loaves of bread in process, but each time learning something new. 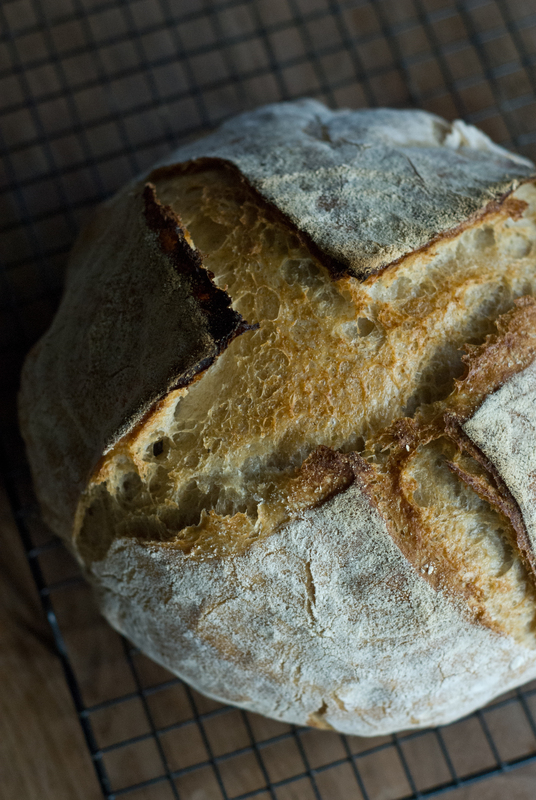 Sourdough bread-making may seem like an ambitious place to start, but it is actually very simple and more forgiving than yeasted bread-making. The rise times are much slower, the temperature doesn’t matter as much, and my favourite recipe doesn’t even involve kneading. But the best part of a true sourdough bread is the flavour and digestibility. The standard yeasted breads (most, if not all supermarket loaves) which are made with sugar and large amounts of commercial yeast and made within a few hours don’t get the time to pre-digest the proteins (gluten) and starches in the grains. This can be an issue for people who may have a more difficult time digesting wheat and gluten in the first place. The high yeast content and sugar in these fast breads can also exacerbate any issues with candida and eczema. Many people who have a hard time digesting grains find they can tolerate a slow-fermented sourdough bread. And the bonus is that these fermented breads have a way more complex and enjoyable flavour. This is the simplest version of traditional sourdough that I make. It’s about an 80% hydration sourdough bread, which means it is a wetter dough than a standard bread dough. The increased hydration (water) helps to create a better environment for the bacteria and yeasts and is partly responsible for the lovely big holes in this bread. The wetter dough can be harder to handle, which is why the no-knead method works perfectly for this sticky dough. 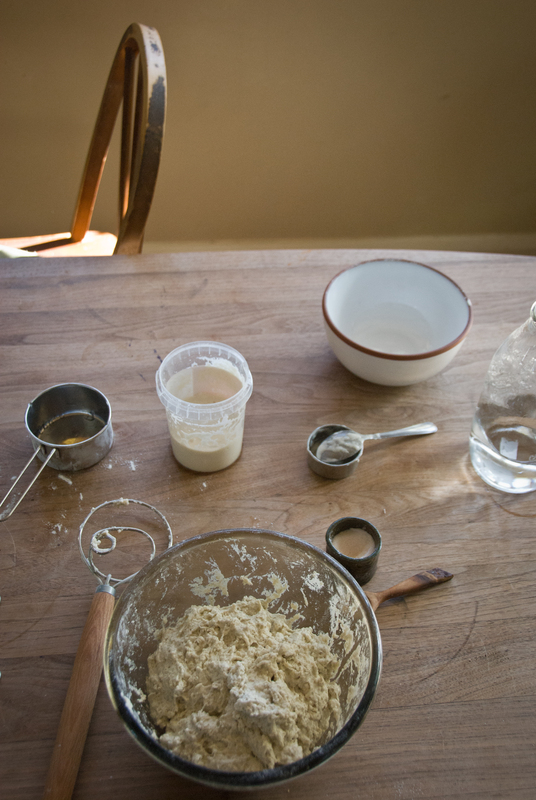 All of the ingredients go into a mixing bowl and get mixed briefly into a shaggy dough (see photo below) either by hand or using a wooden spoon or a dough whisk. 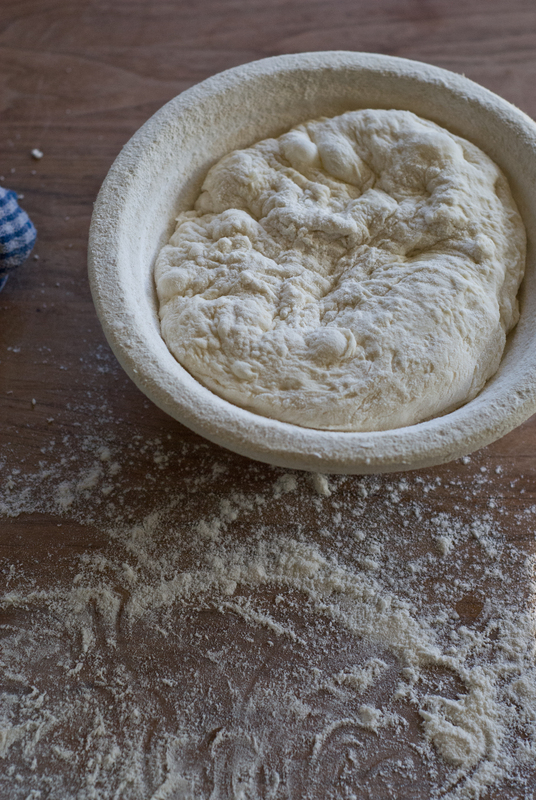 The bowl gets covered and the dough is left to do its fermentation business over the next 12-24 hours, depending on the temperature in your kitchen and when you can get back to the risen dough for the next step. It then gets gently shaped and left again for an hour or so to do its final proofing. And then it gets baked in a super hot oven, either using a Dutch oven or bread cloche or just on a baking tray. And then you get to break open that gorgeous loaf of crusty, bubbly goodness. Oh, and impress all of your friends with your mean-as bread making skills, and hope they eat gluten. I have included both weight and volume measurements. Weighing is going to produce more consistent results. If you haven’t got a scale, don’t worry. I have been making this bread for a few years now and I used to always measure by volume and it still works great. *6-12 hours before making your bread dough, take 50gms of your sourdough starter and feed it with 100gms filtered water and 70gms high grade white flour or bread flour. Allow it to sit loosely covered at room temperature for 6-12hrs to ripen. It will then be ready for adding to your dough. Your starter should have doubled in size in that time and look bubbly and smell sweetly sour and yeasty. If this isn’t happening, you may need to strengthen your starter for a couple of days before using. Check out my post on Starting & Maintaining a Healthy Sourdough Starter. Place ripe sourdough starter into a large mixing bowl. Add filtered water and stir well to make a slurry. Add flour and salt and mix briefly into a shaggy dough (see first two images). 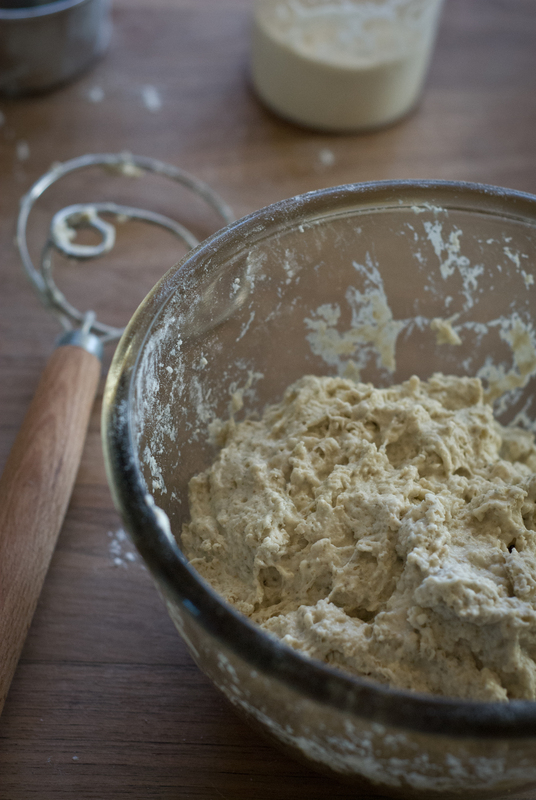 There is no kneading involved at all and the dough doesn’t need to be smooth, but the flour needs to all be moist. Cover with a plastic bag or clean tea towel and leave on your kitchen bench for 12-24 hours or until the dough has doubled in size with lots of bubbles. In the warmer months I usually only leave the bread for 12 hours. In the cooler months I leave it 18-24 hours. But leaving it too long can cause the dough to over-proof and flatten as it bakes. You will need to use your judgement for this part. You can also put the dough into the fridge after 8-12 hours if you won’t be able to get back to it in time or if leaving it to rise fully will result in a 3am bread-baking session. It will be fine in the fridge for 2-3 days, but will get too sour and over-proofed if left longer. Don’t punch the dough down. We want to keep the air in the dough. Generously flour your work surface. With a wet rubber spatula or wet hands, carefully tip the bowl and scrape the sides of the dough and remove it from the bowl. The aim here is to keep as many of the bubbles intact as possible for a fluffyloaf. Flour your hands well and carefully pull the edges of the dough to create a rough rectangle (see images below for shaping). Fold the dough into thirds by bringing the side edges over one at a time as pictured. Fold again but into thirds vertically, bringing the top third down into the middle and then the bottom third up. Gently pinch your seams together. Place shaped dough seam-side-up into a floured banneton or a bowl lined with a well-floured tea towel. Sprinkle with flour and place a tea towel over the top. Allow the bread to sit in a draft-free location on your bench for 60-90 minutes or until the loaf has risen well (about doubled in size again). Sometimes this takes longer in my kitchen as it can be rather cool in the winter months. About 45 minutes before the bread has finished rising, turn on the oven to 240 degrees Celsius and move the rack to the centre position (I use an inexpensive oven thermometer to make sure my oven is getting hot enough). Place a baking tray on the middle rack of the oven and another tray or metal baking pan on the rack underneath the middle rack (this will be for the hot water to create steam). You can also place a bread or pizza stone into the oven at this point if you have one, but not necessary. **See note below for using a Dutch oven for baking in. Once the proofing time is up and the oven is very hot and has been preheated for about 30 minutes, carefully tip the loaf out onto a piece of baking paper. Slash the top using a very sharp knife or a bread lame. Slide the loaf onto the baking tray on the middle rack and pour a cup of hot water into the baking pan underneath and quickly close the oven door to trap the steam. Bake the bread for 40-45 minutes or until the crust is deep golden and the loaf sounds hollow when tapped on the bottom. Allow the loaf to cool on a wire rack for at least 20 minutes (ideally 2+hours) before cutting into it. **If using a Dutch oven with an oven-proof handle to bake the bread in, begin heating the oven to 250 degrees Celsius 45 minutes before the final proof is done. No need to add a second tray for hot water as the Dutch oven will trap the moisture as the loaf bakes and create a beautiful crisp crust. At the end of proofing, carefully tip the loaf out of the banneton or bowl onto a piece of baking paper. Slash the loaf with a very sharp knife or bread lame and place into the hot Dutch oven. Cover with the lid and set the timer for 30 minutes. After 30 minutes, remove the lid and turn the oven down to 210 degrees Celsius and bake for a further 15 minutes or until the loaf is deep golden and sounds hollow when tapped on the bottom. Carefully remove from the pan and cool on a wire rack for at least 20 minutes (ideally 2+ hours) before cutting into it. This loaf above was made with 1/4 wholemeal rye flour so doesn’t have as many big holes as the loaves I make with 100% white flour, but the flavour is delicious and the bread is surprisingly fluffy! Thanks Nicola 🙂 I have really enjoyed getting more confident with making sourdough bread. The end product is well worth the wait for slow rise breads. Can’t beat that flavour! We really enjoyed your tea cake, by the way. And the huge pile of persimmons in our fruit bowl. Must get our fill before they are all gone! can a sour dough started be made or do i have to find someone who already has one? You can make your own really easily. It takes between 4-10 days to become active and will take a few weeks to reach its full strength, but starting your own is a fun experiment while watching it slowly start to bubble and then grow over several days. Here is the link to the post I wrote on starting and maininting a sourdough starter. Let me know how you get on and if you have any questions! Try asking on Freecycle Tia, it is a good place to find people who are willing to share. Thanks for this variation on sourdough Rusty. I usually use wholemeal flour (preferably organic, stone ground) and add some seeds. 200g flour to one cup of starter seems to do the trick. But I will try your method next week! Let me know how the method works for you. I also love the addition of wholemeal flour and seeds. I’ve been lucky enough to borrow my friend’s flour mill which grinds a beautiful stoneground flour. The sourdough starter LOVES the fresh ground flour. Hi Alison, I’m so sorry I haven’t gotten back sooner! I didn’t see this comment pop through on my email for some reason so I apologise for the delay in getting back to you. I use a higher hydration starter for a couple of reasons. The first is that I can feed it and it is ready to use quite quickly (as early as 4-8 hours depending on how warm it is). The second reason I like it for this particular recipe is because it is a thin consistency and therefore good for a no-knead recipe. 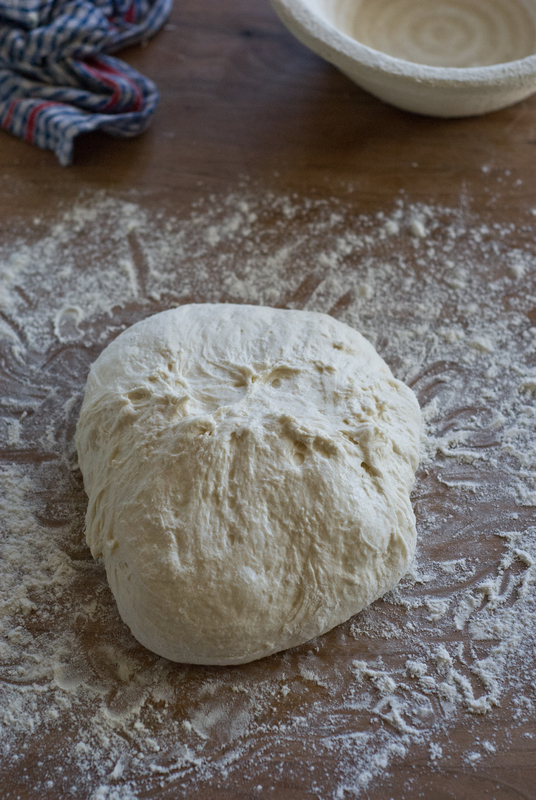 A thicker starter can require more kneading to incorporate it into the dough properly. This thinner starter just needs to be added to the water and easily blends in thoroughly. However, one of the drawbacks to a higher hydration is that the starter does double in size quickly and therefore needs more frequent feeding and/or refrigeration for maintenance. If you are finding that you are getting a layer of hooch (that liquid on the surface) after only 24 hours or less it means you may have to go to a lower hydration (more like the 100%) to keep it happier for longer. Hooch is a sign that all the food is gone and your starter is hungry and needs more flour. Here in Wellington it is often quite cool (sigh) and I can maintain my starter easily at this hydration. But in warmer areas you will find you need to feed more frequently or feed the starter, use it after about 8 hours and then immediately feed again and store in the fridge. An easier option may just be to move to more of a 100% hydration. I hope that is helpful for you. There is SOOOO much to discuss around different weather, flours, temperatures, water types, etc, etc and sometimes it is just about playing around to see what works best for you in your climate with your flour and water. But I would definitely try increasing your flour content to keep your active starter a bit happier. A very long-winded reply, sorry! Thanks so much for your comment and feel free to let me know how you get on! I have been playing around with your method for a few days, but all my loaves turn out flat? Everything seems to go well until its time to bake and then when I tip the dough from the banneton onto the baking tray it just pancakes. Any thoughts? Hi Hanna, thanks for your comment. Try reducing the water to 325 gm/ml and see if that helps make a more structured dough. Also, for the first proof/rise, just let it ferment until it has doubled in size. If it over ferments it can flatten during baking. One other thing I do is give the dough a few stretch and folds in the first couple of hours to increase the gluten structure. I’ve actually got a new improved method that I will be posting in the future. Have a look at ‘stretch and fold’ technique online. This can really help. And please let me know if you have any more questions. I’m also keen to know if those tips help your bread rise better! I started my starter two weeks ago, originally with white high grade flour and then changed it over to a combination of wholemeal flour and rye meal flour. My starter doesn’t seem to rise much in the jar, and the two loaves of bread I tried to make didn’t rise much during any stage of the process. For feeding my starter I’ve been using 1/2cup starter to 1cup flour and 1 cup water, as this was the ratio I was told to use by others. Am guessing if it won’t rise in jar during fermentation, then there is no hope to expect it to rise a bread. I have lots of lovely bubbles through the side of my jar, not much on top tho. Hi there, you are correct, if no rise in the jar, there won’t be rise in the loaf. It may need a few more weeks over the winter months to get a good yeast culture going. Hiya! I’ve just started on my sourdough journey and after a couple of failed attempts, I’ve come across your recipe! My issue is, after the 24 hours of leaving the dough to rise, it was still so sticky/soft that it was near impossible to turn into a loaf. What would you recommend to combat this? Would reducing the initial water size be enough? Hi there! Yes, try reducing the water to help with that. I don’t quite understand the instructions for the start of the process. You say to use 70gm of starter, then have a sort of footnote that tells me to take 50gm of starter, add 70gm flour & 100gm of water = 220gm. Is it 70gm, 50gm, or 220gms that I add to 455gm flour, etc? This recipe was suggested by someone I met at a cropswap who had baked the most wonderful sourdough bread using your method.